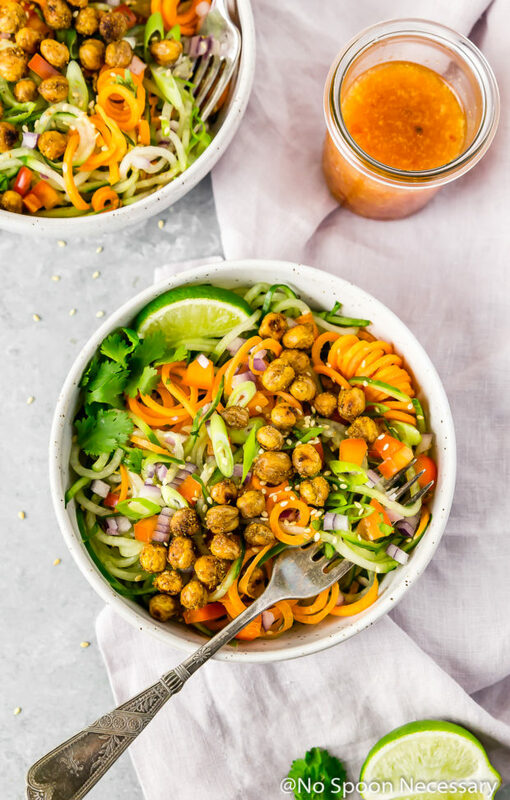 Crunchy, Thai spiced, roasted chickpeas with tender-crisp cucumber and carrot noodles, fresh veggies and a light, sweet n’ sour dressing. 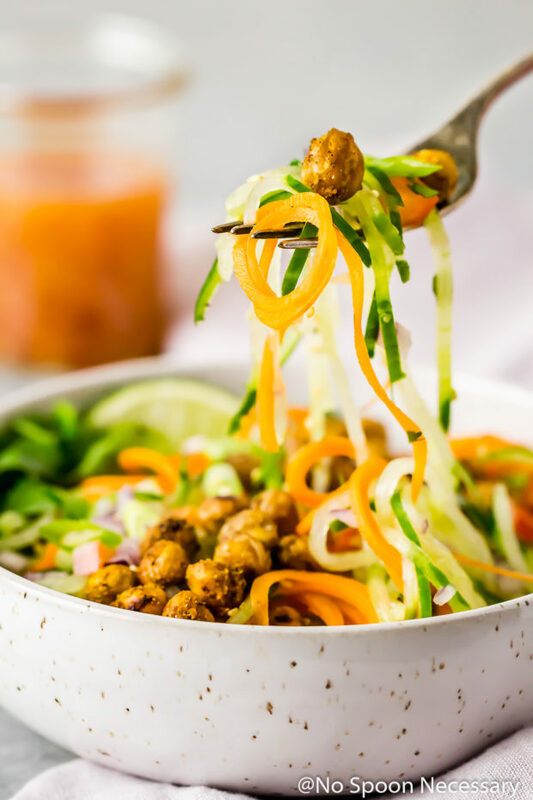 This Thai Roasted Chickpeas with Vegetable Noodle Salad is healthy, refreshing and perfect for summer! Well hello, friends! How was your weekend?! I had a fantastic weekend, thank you for asking. 😉 We had so much fun in Wrightsville Beach. …Bum planted in a lounge beach chair, toes in the sand, cocktail in one hand and a book in the other. The coastal breeze and summer sun upon my face, while the sounds of classic 70’s rock and 90’s alternative filled my head (<– I have eclectic taste. I know.) Walks on the beach, room service on repeat and a nice date night out. Honestly, an extended stay at the beach was exactly what the doctor ordered. Well, not a real doctor, although they really should write prescriptions for R&R. It was the perfect reset and I’m sad it is back to reality. Obviously. Anyways, I’m in that weird mood that accompanies getting back from a vacation – where you feel like you need a vacation from your vacation. Therefore I’m going to keep it kind of short today. That said, let’s be real for a minute. If you follow this blog you are probably looking at the photos and asking yourself what’s going on… where is the fruit? Where are the grill-masta’-like char marks? Well, I ate all the fruit, I typically reserve grilling for dinners, and this is what I have been devouring daily for lunch. Plus this bowl of healthy yum is perfect for #MeatlessMonday. 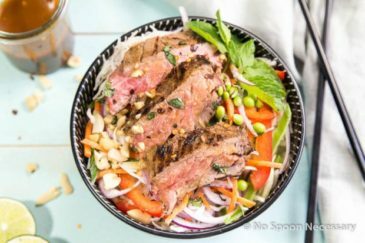 Light, healthy and refreshing, this cold noodle salad totally satisfies my summer cravings. 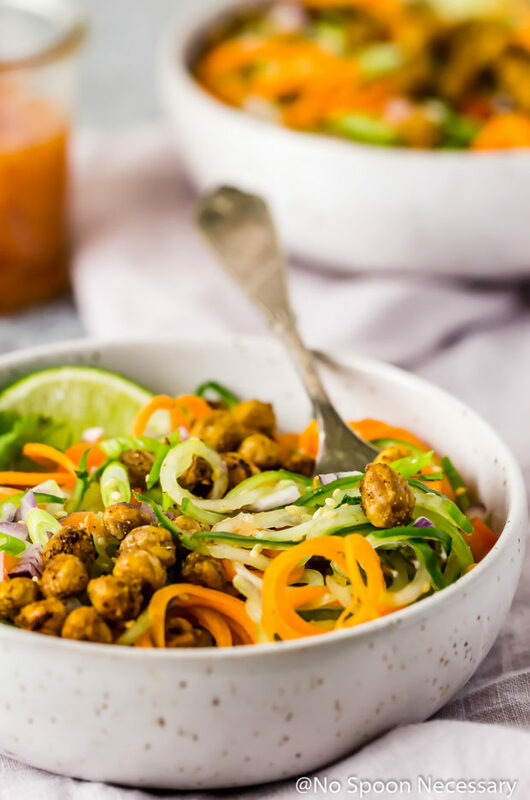 With warm, Thai spiced, roasted, crunchy chickpeas; cool, crisp cucumber and carrot noodles, fresh veggies and a light, tangy, sweet n’ sour dressing, this salad checks all the right boxes. Plus, this pretty bowl of spiralized noodle-y fun couldn’t be any easier to throw together. Simply season and roast some chickpeas, spiralize carrots and noodles, chop a few veggies, whisk together the dressing and gently toss everything together. 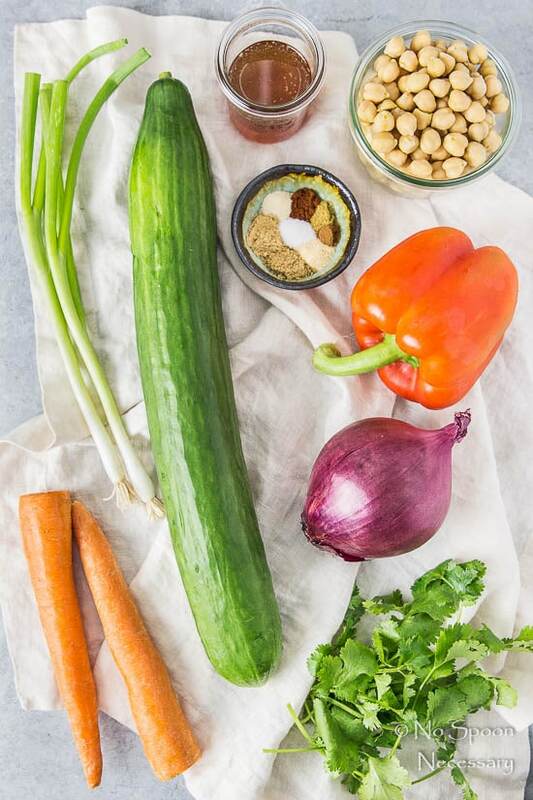 Roasting chickpeas is quite simple and easy, however there are a few tips to ensure your chickpeas are crispy after roasting! First, make sure you drain and dry your chickpeas well before roasting! Removing as much moisture as possible is essential! And, if you want to take things one step further, I recommend peeling the chickpeas. I know it’s an annoying task, but it will make a difference. So, if you have the time and patience, peel those suckers. Second, toss the dried, cooked chickpeas in oil and seasoning. Just like roasting anything in the oven, oil will aid in the crisping process. Third, make sure you shake the pan halfway through roasting to ensure even crisping and browning. Last, once you are done roasting, allow the chickpeas to cool on the pan before using. The heat from the pan will continue to crisp the chickpeas as they are cooling. How to season roasted chickpeas? You can season chickpeas before roasting with any spice combination you would like! Think – cajun seasoning, taco seasoning, or seasoning simply with salt and pepper. 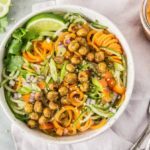 In this Thai Roasted Chickpeas with Vegetable Noodle Salad recipe, the chickpeas are seasoned with a flavorful bled of Thai inspired dry spices – garlic, ginger, coriander and cinnamon to name a few. If you cook your own chickpeas substitute 1 ½ cups of cooked chickpeas for 1 can. Have you tried the slow cooker method yet? It is stupid easy and tastes way better than canned. Since I started cooking my own chickpeas a while back I haven’t touched the canned kind. Give it a try, I promise you will be surprised at how much better they taste. Regardless of what type of chickpea you use (canned or cooked by you), make sure you dry the chickpeas very well before roasting. The key to crispy roasted chickpeas, is to make sure they are as dry as possible before roasting. I use paper towels to dry them and then allow them to sit out on the counter for 20-30 minutes to air dry even more before roasting. But, if you don’t have time, at least paper towel dry them well. 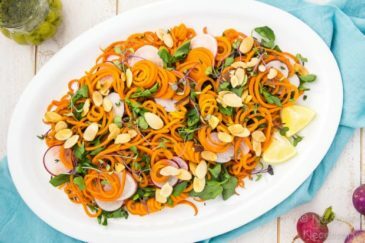 If you don’t have a spiralizer you can’t make this salad. Kidding!!! You can use a vegetable peeler to make long strands of cucumbers and carrots. Obviously a peeler won’t produce fun, curly strands, but it will still make “noodles”. You can make the vegetable noodle salad in advance, but the cucumbers will release water as they sit, so keep the cucumber noodles separate. You can also roast the chickpeas in advance, but you want to keep those separate as well. They will lose some of their crunch if made in advance, but you can reheat them for 5 minutes in the oven to restore their crispiness. 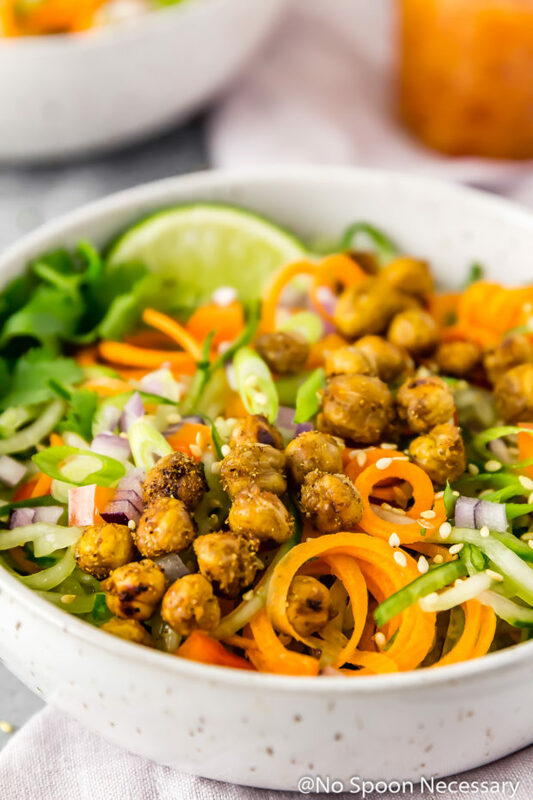 Perfect for lunch or an easy weeknight dinner, this Thai Roasted Chickpeas with Vegetable Noodle Salad is sure to please! Until Thursday friends, cheers – to oodles and oodles of sweet n’ sour veggie noodles. 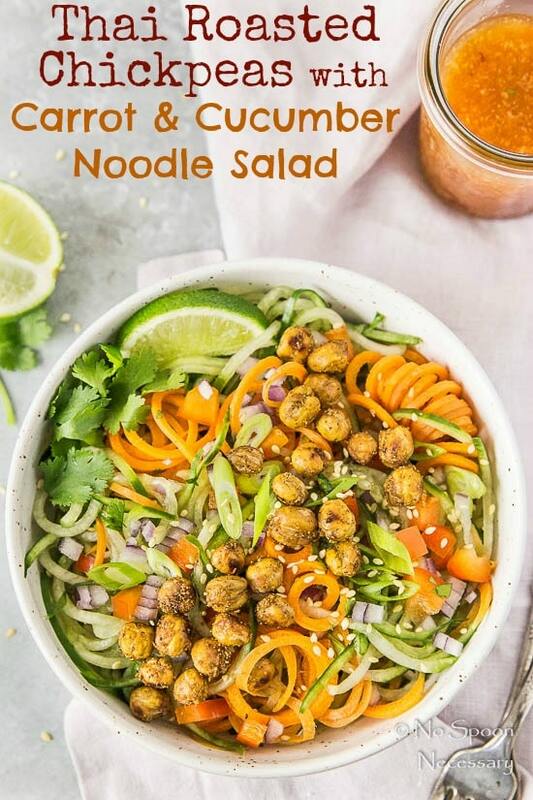 With warm, Thai spiced, crunchy, roasted chickpeas; cool, crisp cucumber and carrot noodles, fresh veggies and a light, sweet n’ sour dressing, this salad is healthy, refreshing and perfect for summer! Roast the Chickpeas: Preheat oven to 375 degrees F and line a large baking sheet with aluminum foil for easy clean up. Toss chickpeas with oil to coat and then with spices. Spread chickpeas out on baking sheet and bake for 40-45 minutes, or until chickpeas are golden brown and crunchy. Make sure you gently shake the pan to stir the chickpeas and ensure even crisping halfway through roasting. Remove from oven and allow to cool on pan for 5 minutes. Meanwhile, Prep the “noodles”: Use a spiralizer or vegetable peeler to cut the cucumber and carrots into noodles. Pat the cucumber noodles thoroughly dry with paper towels. 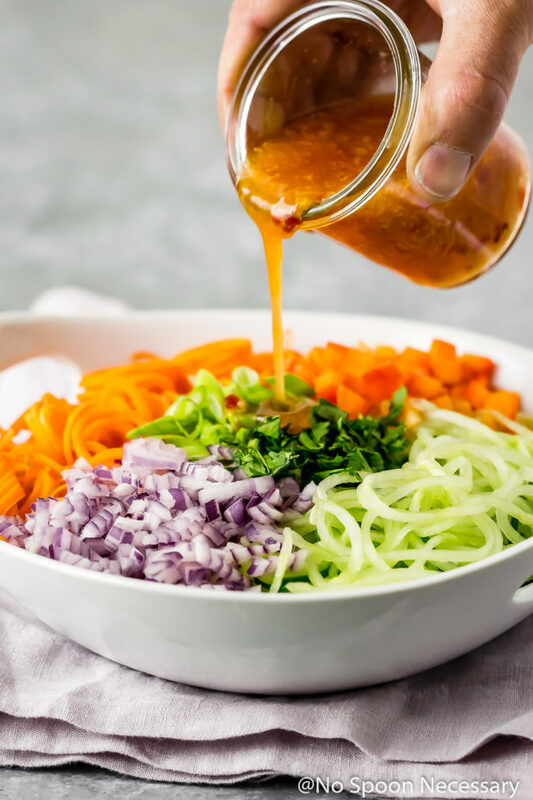 Make the Dressing: In a small bowl whisk together all dressing ingredients. Set aside. To Serve: Divide the salad between serving bowls and top with roasted chickpeas. Garnish with sesame seeds if desired. Enjoy! *You can substitute 1 ½ cups cooked chickpeas for canned. *Make sure you dry the chickpeas very well before roasting. If you have time, dry them with paper towels and let them sit on the counter to air dry for 30 minutes before roasting. *You can make the salad in advance, but the cucumbers will release some of their water and thin the dressing. Do not top the salad with roasted chickpeas and sesame seeds until ready to serve. *Roasted chickpeas can be made up to 1 day in advance. Cool completely and store in an air-tight container on the counter. Reheat at 400 degrees F for 5 minutes to restore crispness. Love this salad idea! I’m always looking for new tasty and healthy salad recipes. Can’t wait to try this with the roasted chickpeas! 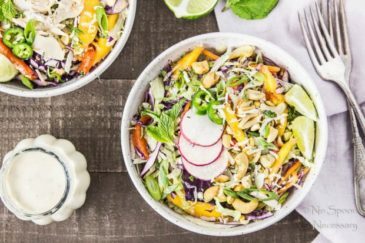 I need this salad, Cheyanne – it’s going to be boiling hot here the next couple of days (triple digits) and this salad looks so cool and refreshing. Glad you had a relaxing weekend – everyone needs a break now and then – and a beach weekend is the way to go! I’m so glad you enjoyed your much deserved R&R. I think 1970’s rock, rocks and since I was in HS in the late ’90’s (Oops! I just dated myself – I’m OLD) I like that, too. You totally killed it with this salad. I l-o-v-e it. Roasted chick peas used to be one of my favorite snacks and I love how you’ve spiced them! I’m definitely making a low carb version for my family this Summer. Thanks! I absolutely love this! Chickpeas have become a very easy customizable snack for me, but I haven’t been adding them into my meals as much as I can. Love the spices, I’ll be making this soon! Glad to hear you’re having a great holiday, Cheyanne! 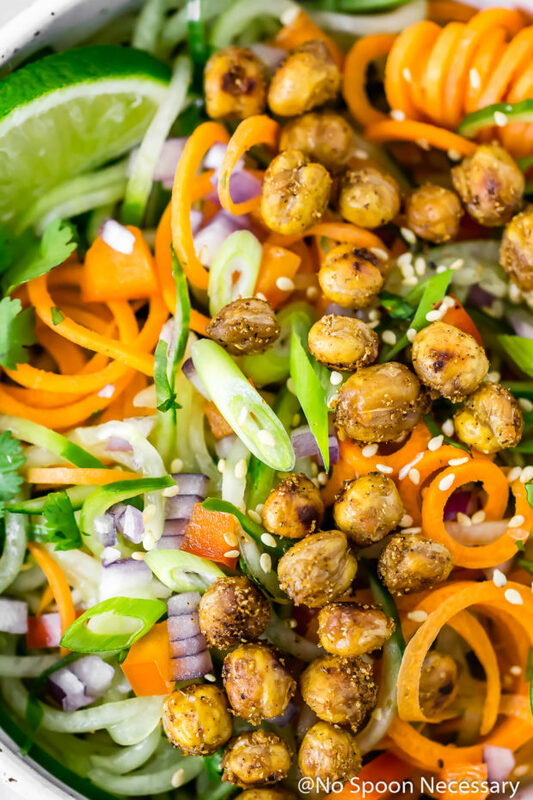 🙂 This salad looks gorgeous, love the Thai roasted chickpeas. 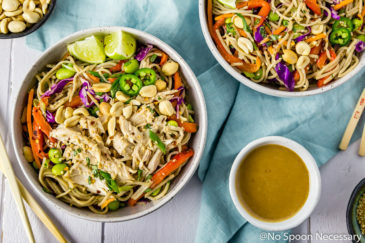 Super delicious combination with the cucumber and carrot noodle salad. Great recipe!